This is a quick how-to article on how to test power supply board BN44-00161A / BN44-00162A and the number of other boards with the same connector and sometimes functional parameters. At the end of the article there are links for repair kits, repair service and exchange services available from Coppell TV Repair. 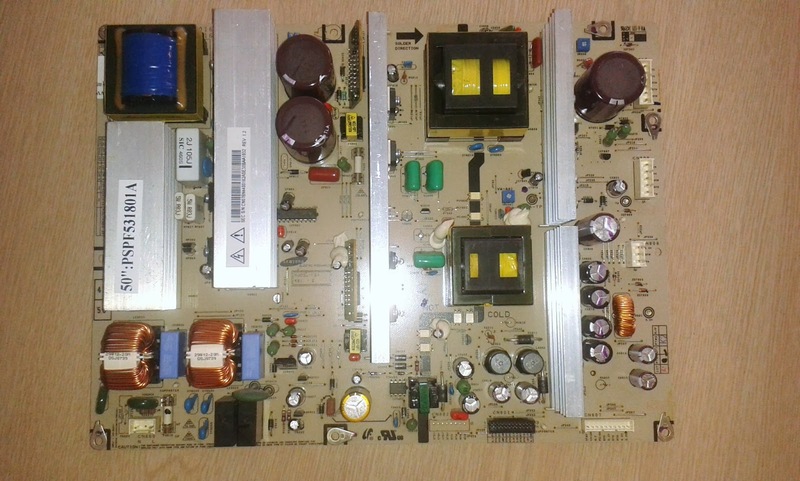 Everything stated here in regards to testing here also applies to Samsung power supply boards BN44-00160A and BN44-00188A , which have the exact same form factor and connectors as BN44-00161A and BN44-00162A. The list may not be complete, but the principles in testing are going to be pretty much the same for all other boards that look similar and have the same control signals, even if marked slightly differently. Still, responsibility for transferring the knowledge and experience from here to another power supply board is yours...we only guarantee it to have been tested on the models mentioned here. Please note that the fact that the boards are tested in the same fashion does not necessarily mean that they are compatible with each other! For example boards for 42'' models are likely going to be overloaded and shut down or burn when loaded on a 50'' model that requires more power. Some of the TV models that utilize the boards covered here are Samsung HPT4234X/XAA, HPT4254X/XAA, HPT4264X/XAA, HPT5034 (HP-T5034), HPT5044 (HP-T5044) and HPT5054 (HP-T5054). The test described here is going to be very useful for owners of the 50'' models which are known to develop a problem with the Y-Main / buffers trio, which is often confused and blamed on the power supply, which actually fails relatively rarely compared to them (apart from a known simple issue with bulging capacitors visible to the naked eye). On the other hand, the 42'' models have a known widespread problem developing in the Va tract of the board. It does not affect the 50'' models nearly close as bad. Disconnect all cables from the board. You may run the test while the board is mounted in the TV or taken outside of it. In either case the only cable from the TV you will need is the AC power supply cable. 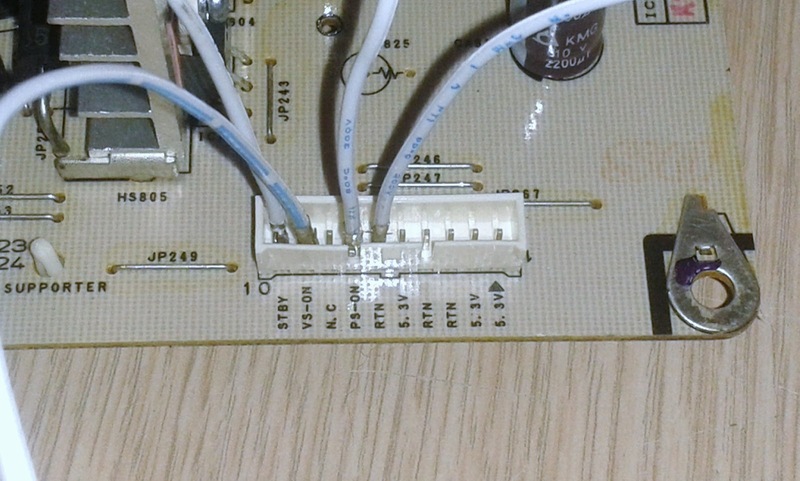 Instead of using RTN you can use the metal piece on the right side of the connector at the corner of the board, which is supporting the screw used to fasten the bolt to the chassis or you can use any point from the TV's panel or chassis as well if the board is mounted in the TV. Also, you should get between 2.6V and 5V DC reading on the PS-ON pin (again to RTN). If you do not get any of those two and are sure you have AC power supplied properly then the standby voltage of your PSU is not functioning and needs service or replacement. Troubleshooting that is beyond the scope of this article, but at the end there are links to our repair services. 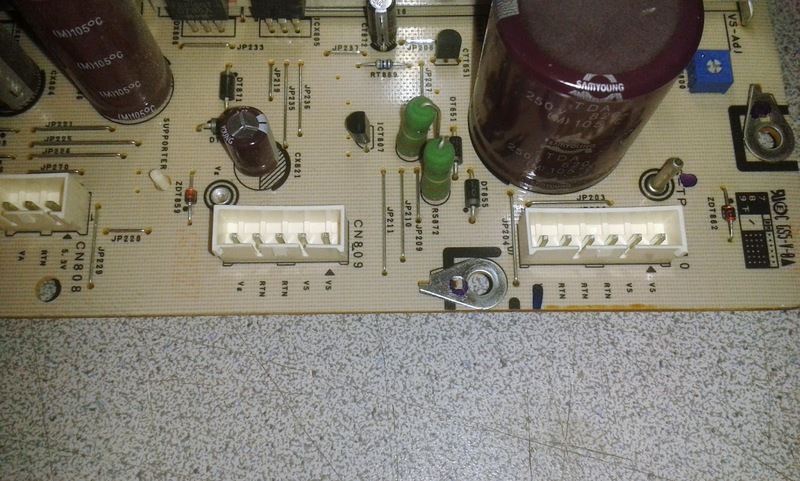 Step 2 - activating the power supply board and receiving Vg, Va , audio amplifier voltage etc. We recommend you do the actions below when the power supply is disconnected from AC power to prevent accidental shortages and problems. To activate the board one needs to short the PS-ON pin on CN807 to ground, i.e. RTN. 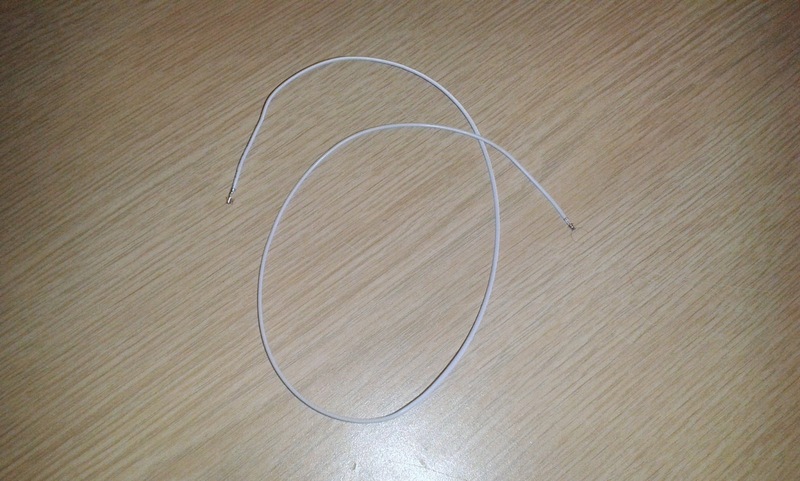 You can use a wire from a cable as one shown here and which is what we used for this pictorial. Be careful and make sure you do not short out other pins on the connector! There is nothing special about this wire and you can get one similar to it from an old unused ribbon cable or order two for a dollar if you want. You can probably also use a simple jumper used in older IDE hard disks, computer motherboards and other electronics for configuration selections. When you short the two pins and supply AC power to the board it should click once (or could be twice , really fast, as it has two relays and sometimes one of them may respond with a slight delay...it can still be considered ONE click, though, even if a double one) and then stay silent; if you have a good hearing you may hear a quiet buzz coming from the board. If you have a voltmeter and more curiosity you can venture into measuring voltages as explained below. Also important, you should be able to measure 18V between the Vamp pins on CN801 and RTN (or chassis). CN801 is the two-row black connector located to the left of CN807 at the low right side of the board and which I did not make picture of, sorry. The audio power fails very rarely, but if memory serves me well it is not monitored by the board, which means that if is not there the board would remain on, which would lead the TV to turning on and then off as the main board will shut it off noticing the lack of Vamp...yet the symptom would point to a faulty power supply board. 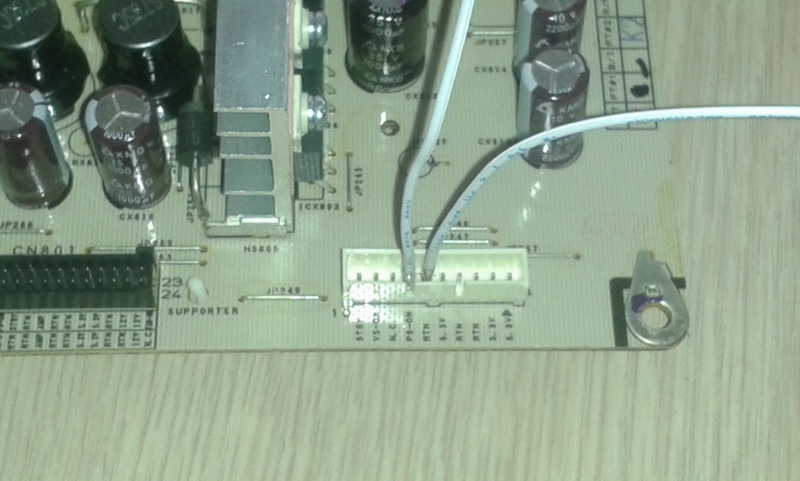 Anyhow, if the board is OK you should hear it click and be able to measure those voltages. If the board is not OK then it will either remain silent (rarely) or there will be one click (or one double-click) followed, after a second or so, by another click / double-click. The second click indicates the board's protection has kicked in and shut it down. The board would then need a service or replacement - see the end of the article for that. Troubleshooting is beyond the scope of this article. Vs is the highest and most powerful output voltage of the board. It can not be produced if Va is not functional (not without tweaks on the board anyway) and often times the presence of Vs is considered the ultimate test for board's functionality. That can be misleading as noted in the Vamp note above, but for practical purposes is pretty darn good. Again we recommend performing the step below when the board is disconnected from AC. 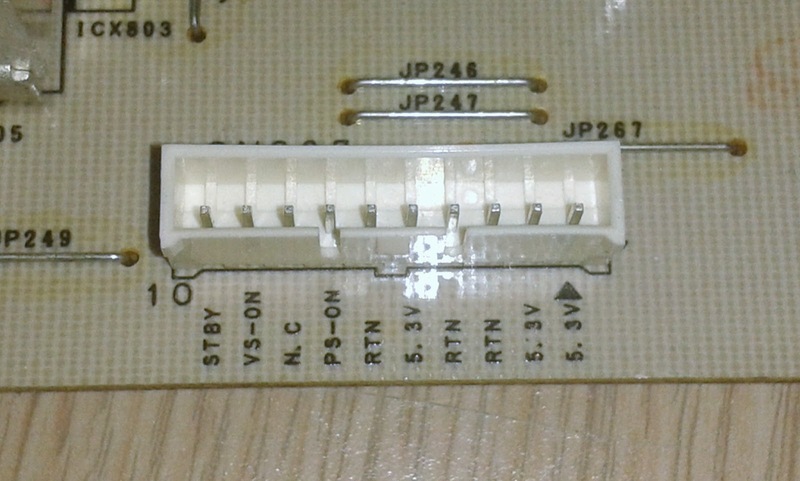 To get Vs out of the board you need to have the board activated (PSON to RTN) and VS-ON from CN807 supplied with +5V. You can use the 5.3V from the last two pins on CN807 or the STBY pin. Nothing different should be seen or heard compared to activating the board in step 2, except maybe a slightly different buzz to the experienced ear. Upon connecting AC, if the board is good it should again click once and, shortly after, Vs should appear on CN810 at about 207V measured to RTN. If you do not have a volt-meter you can run the ultimate test by simply shorting the pins shown on the above picture, supply AC power to the board, wait for the click, wait 5-10 seconds and disconnect AC power. If the board clicks on again when you disconnect power (this time to release the relays) then chances are very good that the board is functional. Note this is not entirely true , in a volume sense, to the 42'' models of the boards: they often develop cold solder joints which may appear to work fine in a single test, but would cause problems in continuous use. Of course the same applies for cold solder joints in any type of board, but the 42'' versions are known to develop it...so a single test is not conclusive in regards to a "sometimes works" symptom. It is , however, fairly good for a "reliably not coming on" symptom. A second click shortly after the first one is an indication of a problem, which, for the last time,we will not be attempting to troubleshoot in this article.